These carved art appliques can be put on any HDU or wood sign of sufficient size.They are carved from either HDU or wood of various types, and have exquisite detail and finish quality. They can be modified, and are hand-sanded and hand-painted. For wood, including Mahogany, they can be stained and clear-coated. For HDU, they can be artist-brush painted in multi- color enamels or gold, silver or copper-leaf gilded in HDU. One of these only increases the cost of the sign by $25 to $100, depending on size and finish.These carved sculptures will make your sign sign unique and classy at a budget price. 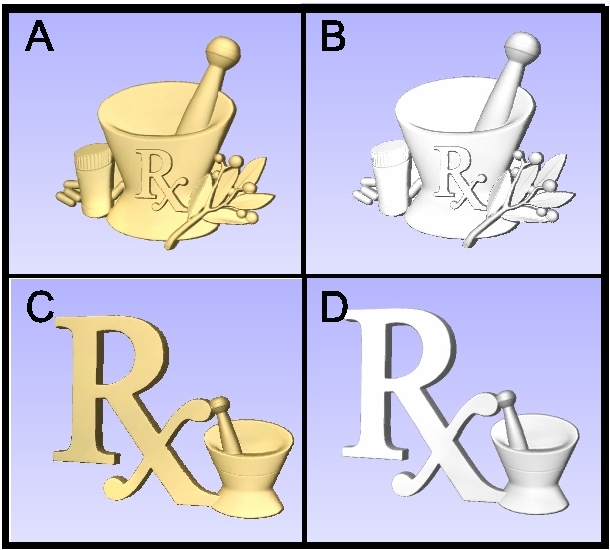 To see styles of sandblasted or engraved 2.5-D, or premium carved 3-D High-Density-Urethane (HDU) signs and plaques for other medical offices, clinics, hospitals, physicians, nurses, optometrists ,chiropractors, pharmacists, psychologists, counselors, and other health care professionals, please click on Gallery 11 - Medical and Health Professional Signs and Plaques.